New tidings from the world of McConvilliana — always delightful and surprising! Leo Jr. told me at our last meeting that his father was famous not only for his beautiful lead playing but also for his mastery of half-valve playing! Who would have thought Leo McConville a precursor of Rex Stewart’s BOY MEETS HORN? And — on a more personal note — Leo Jr. said that his father had a substantial and beautiful HO train layout, complete with wooden houses, in a large upstairs room in their three-story house. 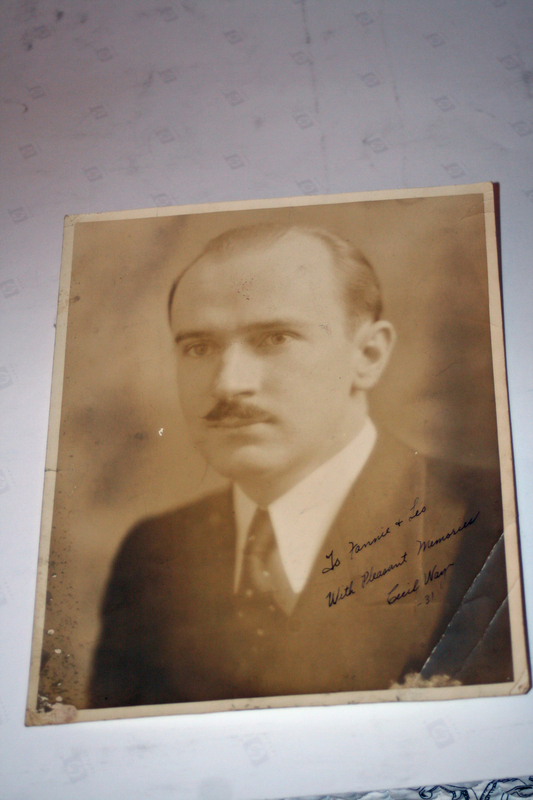 Leo Sr. was so proud of his autographed photographs that he had built picture molding for top and bottom, up at the ceiling and running around the four walls of the room, his pictures there on display. Thus I am happy, in some small way, to recreate that display in installments on JAZZ LIVES. A less happy story concerns Leo Sr.’s terror of bridges (I’ve also heard that his fears included high buildings) — so much so that his fellow passengers would have to lock him in the car trunk when they went over a bridge. The solution seems as painful as the problem, but I can’t say — bridges aren’t one of my phobias. It is possible that the only way Leo could endure going over a bridge would be in an utterly dark place where he couldn’t see what terrified him. But enough of such matters. 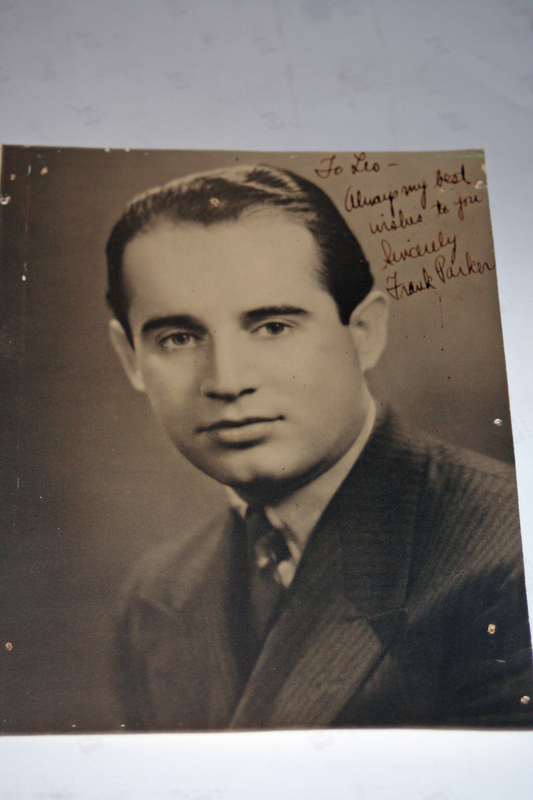 Here’s another half-dozen friends of Leo — some famous, some whose name in the autograph calls up some dim recognition, some obscure. 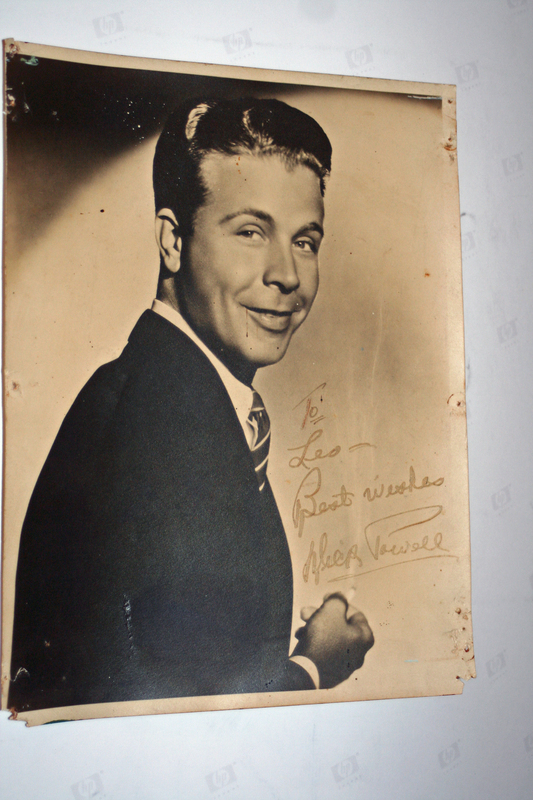 The publicity still is from later in Powell’s life — did Leo meet him while playing in a radio orchestra, or had their paths crossed earlier, when Powell was a hot banjoist / guitarist (and perhaps cornetist, saxophonist) and singer in hot dance bands — including the Royal Peacock Orchestra and the Charlie Davis Orchestra? 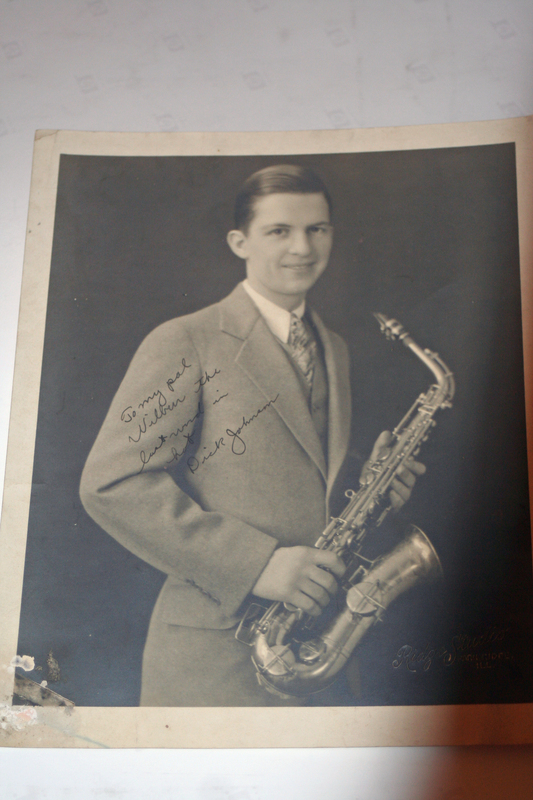 How many readers have heard anything by the tenor saxophonist Jim Crossan (one of the section on a number of OKeh hot dance recordings) much less seen a portrait of him? 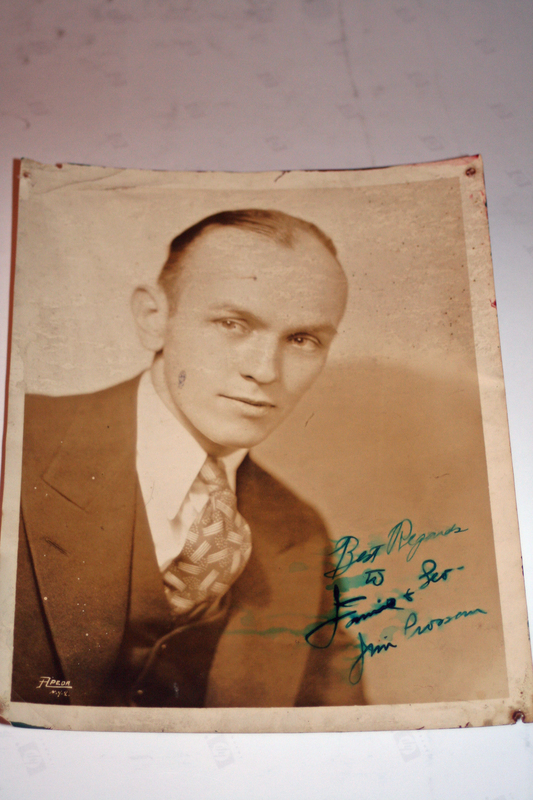 Perceptive readers will notice that Johnson autographed his photo to “Wilbur,” which Leo Jr. said was a teasing name for his father. I imagine (it is speculation) that Leo Sr. made it known to everyone he talked to that he really wanted to leave the music business, buy some land, and have a chicken farm. “Wilbur” must have been the sharply-dressed New Yorkers’ nickname for a deep-down hick. We are indeed known by the company we keep, and Leo had a wide range of musical friends! 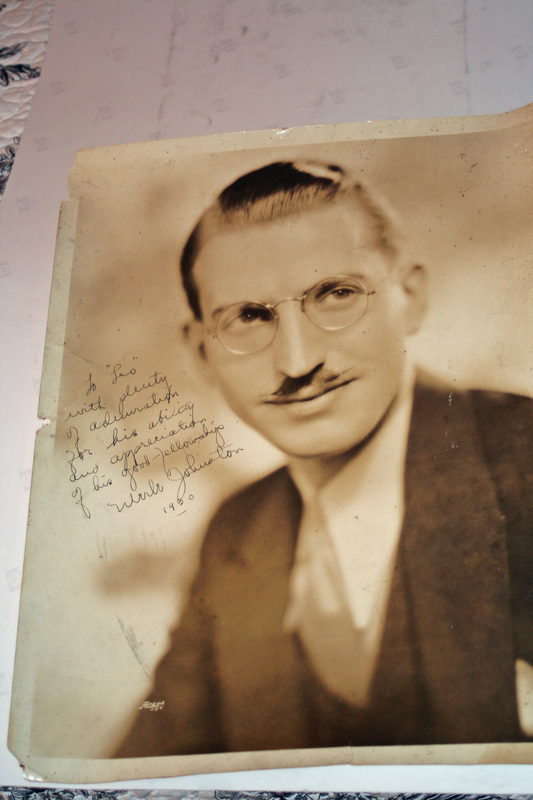 Not all of them had lip muscles, but Leo was an easy-going fellow. . . .
Walt Roesner and his Capitolians — the large all-star all-purpose orchestra that appeared at the Capitol Theatre in New York City — made a Vitaphone short film in 1928. Two-thirds of the film is given over to 1) an impassioned tenor singing O SOLE MIO, and 2) an impassioned tenor singing ANGELA MIA. Although these specialties are beautifully performed, they lack a certain savor or liveliness. But the last number by the orchestra is Hot, truly so. And members of the band get to show off their considerable (sometimes quirky) solo talents in brief outings — with some of the most famous names in jazz doing their bit: how about Jimmy Dorsey, Arthur Schutt, Rube Bloom, Miff Mole, Leo McConville, Bruce Yantis, Vic Berton, Nat Brusiloff, Jimmy Lytell . . . ?! The eye is at first struck by the sheer number of beautifully-dressed men on the bandstand: twenty-five, perhaps, all with white flowers in their buttonholes. Two pianos, a plethora of violins, bowed string bass, bowed cello. Drummer Vic Berton standing in the rear amongst a good deal of percussion, including tympani. Roesner opens this number with the cheerful explanation that his musicians have had an appropriately “heated argument” about which one of them is the hottest man in the band. Not a bad idea. The bouncy tune that opens the proceedings is I’M MORE THAN SATISFIED by Fats Waller and Jo Trent (a song, which, like many famous hummable Waller tunes, repeats one catchy phrase often as a melody line) — recorded most memorably in this period by two fellows named Beiderbecke and Trumbauer, as “The Chicago Loopers.” Berton is particularly marvelous to watch, keeping time on the tympani with one hand while accenting a choked cymbal, sometimes visiting the head of his huge wooden bass drum — his legs spread to allow him to reach both places, raher like a wooden soldier in those white trousers. I would have been very happy for the band to explore this tune at this tempo for the rest of the film, but the premise moves into a solo features, which allow us to see these musicians on camera in their prime rather than as faces in the ensemble. (Many of them look particularly dark around the eyes: whether this was cinematic makeup or lighting of the time or a lack of sleep, I am sure one of my readers knows.) And the cameraman seems reasonably content with having one-half of an additional musician in the frame, and neatly lopping off the head or hairline of a soloist — but he seems to know what’s going on and to go in for a close-up before everything has concluded. Up first after a piano modulation, Jimmy Dorsey on alto saxophone offers one of his particularly virtuosic solo choruses (in a manner beloved of Frank Trumbauer and Rudy Wiedoeft) showing off his incredible technique instead of hot improvisation. This kind of playing — here superimposed over TIGER RAG — was a JD specialty (hear OODLES OF NOODLES, for one example). Violinist Nat Brusiloff, next to Dorsey, is enjoying the chorus immensely. And JD must have been famous by this time; he is announced by name. Then, showing that you don’t have to go fast to play Hot, we have a memorable twenty or so seconds of one of jazz’s most forgotten men, trombonist Miff Mole, offering a chorus of HOW COME YOU DO ME LIKE YOU DO? complete with breaks (Berton has switched to wire brushes, as we see). 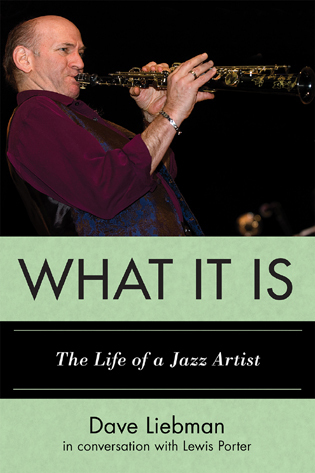 From this distance, Miff no longer seems as radical, as dashing as, say, Jack Teagarden or Dicky Wells, but his solo is masterful: the variations in tone and the way he gets gracefully but precisely from note to note, vocalizing the melody beautifully — and adding that lovely coda. It sounds very simple but it’s an example of how much he must have amazed all the musicians, Hot and legit, for a long time. I call your attention to Miff’s easy command of the horn and especially his glistening upper register, not the usual realm for most Twenties trombonists. Violinist Nat Brusiloff (famous in radio as a conductor and for his early work with Kate Smith — his grandson is trombonist David Sager) offers more variations on the same theme . . . on what sounds like an intensely scratchy violin, with no apparent bow. I’m told he is playing a “single-hair” solo, which I assume is one hair taken from his bow, but the physics of the whole thing are beyond me, in a good way. Tell me where the other end of the single-hair is, please? And at the very end of the solo, Brusiloff permits himself the slightest glimmer of an impish grin, “Geez, I pulled that one off, didn’t I, now?” More violin acrobatics will follow. But violinist Bruce Yantis (someone I know only from a few late-Twenties sides with Eddie Condon, Red McKenzie, and Gene Krupa) is ready to follow Berton and Bloom with his violin solo a la Joe Venuti, his bow disassembled and strapped around his violin so that the hairs play all four strings at once — it looks like fun but it isn’t easy to do well. Luigi Calabrese has clearly heard Eddie Lang, as he should have. Before the ensemble gets itself together (we never find out who the hottest man in the band is or was, although my vote is split between Miff and Vic Berton) trumpeter Leo McConville, usually hidden next to Red Nichols, gets off with a very brief Hot solo (a half-valve flourish at the end?) on the closing I’M MORE THAN SATISFIED. This short seems an ideal window into the best of the Hot late Twenties: that decade’s version of the 1938 Randall’s Island footage, but with sound and close-ups. A ripping yarn!